Comb jelly. By Alexander Semenov. Used with permission. For over a hundred years scientists have assumed that sponges (yep, the animal that inspired your kitchen sponge), are our most distant animal relative. And why not? They sit on the sea floor, filtering water, and generally doing nothing much (they don’t have neurons, muscles or true tissues). Sponges certainly look like they belong in ancient history. Then in comes the comb jelly genome, to mess everything up. According to the new study, comb jellies, not sponges, may be our most distant animal cousin. Now, here’s where the trouble starts: comb jellies have pretty much all the fancy machinery that defines most animals, including true tissue, muscle, and nerves. This means the earliest animals on Earth may have been much much than a collection of cells sitting on the sea floor. The ancestor of all modern animals may have been up and moving around. Not only that, but comb jellies may have evolved much of their nervous system after their split from the genetic line that includes pretty much every other kind of animal (jellyfish, sea stars, flies, people…) They’re missing key ingredients like dopamine and serotonin, which in other animals are critical for nervous system function. As it turns out, these molecules aren’t necessary to make a working nervous system. Presumably as long as you have some sort of molecule that can transmit information between cells, that’s all you need. Of course this is going to cause a huge ruckus among scientists, and more studies are needed to confirm these finding. But either way, a storm has arrived, challenging the way we think about our own history. One thing is for certain, I’m never going to look at comb jellies the same way again. 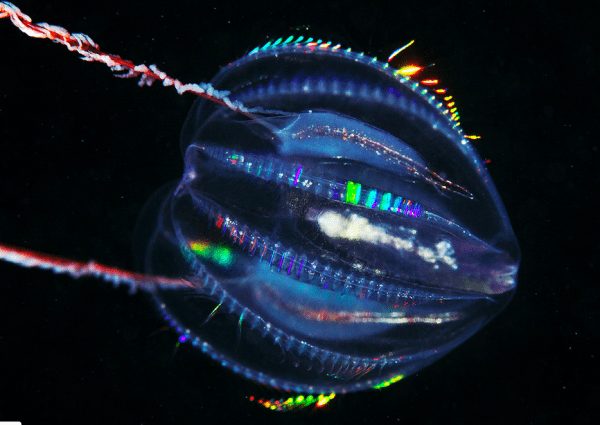 Comb jelly in space! By Alexander Semenov. Used with permission. Reblogged this on Smack of Science.